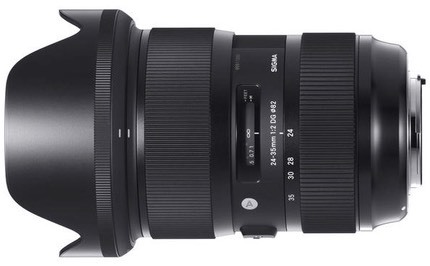 Sigma today surprised a lot of people with an echo of their 18-35mm f/1.8 DX lens: the new 24-35mm f/2 DG HSM lens for FX bodies. The Sigma 18-35mm DX is one of the sharpest, best corrected zooms we’ve seen for the crop format, if not the sharpest. Everything Sigma’s saying about the new 24-35mm indicates it will be the same thing for FX. Indeed, given the specs, size, and design, I’d have to guess that the two lenses are very closely related. The new lens adds some complexity with 18 elements in 13 groups, and 10 of those elements are special glass. But I’m guessing that the 24-35mm is mostly a tweak of the optical formula and image circle of the 18-35mm to fully cover the FX frame, and that left Sigma with a 24-35mm design and an ever-so-slightly smaller aperture. Close focus is again 11” (.28m), with a 1:4.4 maximum magnification. Smallest aperture is f/16, and the lens takes 82mm filters. Like the 18-35mm this is a two ring design with a focus indicator (no DOF markings) in between. This is an Art lens in Sigma’s lineup, so it is supported by the Sigma USB Dock (for updates and focus adjustment). Of course, the question is whether or not such a short focal range is useful or not. In essence, this new zoom replaces the missing 24mm f/1.8, plus the 28mm and 35mm f/1.8 Nikkors. In other words, this new lens covers three of the most commonly used wide angle focal lengths. It argues for a bag that looks something like this: 24-35mm f/2, 50mm f/1.4, and 70-200mm f/2.8. Not terrible, but not particularly convenient in the middle. That’s fine with me, as I tend not to shoot much in the middle.